The "old red barn" is a trademark of our New England heritage. Western Massachusetts was once dotted with these historic treasures, but try to think of where one presently stands. It is easier to remember the barns which are no longer. Historic Barns are disappearing at an alarming rate because their construction often does not stand the test of time. 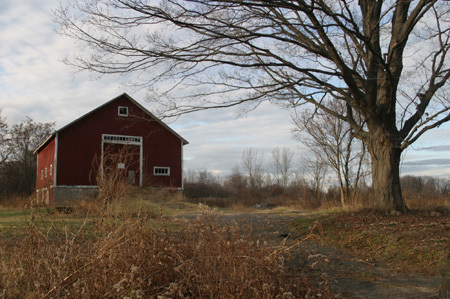 The School Street barn is a reminder of Agawam's rich agricultural history. In its proud new location at the entrance to Agawam's new School Street Park, it bridges Agawam's early history with its vibrant present. It is critical that we take time to thoroughly evaluate its potential. The Agawam Office of Planning & Community Development would like you to join us in a visioning session of the "old red barn". Guest panelists will share their experiences, expertise and ideas. If you are unable to attend, please contact the Planning Office at 786-0400, ext. 283. Walt Cudnohufsky, Landscape Architect, Walter Cudnohufsky Associates, Inc.
Peter Wells, Berkshire Design Group, Inc.